Babywearing – how I came to love it! It seems as though babywearing is the new parenting trend. Gwen Stefani is rarely spotted without her Ergo baby carrier and even Peter Andre was spotted with a baby bjorn (albeit with bad positioning). Whilst pregnant I joined an online forum to discuss all things pregnancy. A number of experienced Mums extolled the benefits of babywearing. Not only did it leave Mums with free hands to get things done but apparently it resulted in calm, happy children, they explained. I was intrigued and so decided to find out more. I discovered that babywearing has been practised for centuries all around the world. Reading that carried babies often cry less, develop better and learn to be more confident in social situations was an interesting concept. I thought that I would give it a go, at least some of the time anyway. During my research I came across what seemed like thousands of different slings each claiming to be the most supportive and comfortable and ranging from cheaply priced to ‘oh my goodness, I need a loan to buy that’! I eventually decided on a Moby wrap which is in essence a long piece of stretchy, jersey fabric. It came with good reviews online and despite looking extremely difficult to tie I was excited to use it. To learn how to put it on I watched many YouTube videos, one of the best being a tutorial by NaturallyThriftyMom How To: Moby Wrap Newborn Hug Hold, who gives step by step instructions using her own child in the demo. Obviously I practised using a cabbage patch doll and although I felt reasonably confident that I could tie it safely, I was a little hesitant to think that soon I would be using it with a real live baby! That first month after baby boy was born I didn’t even consider babywearing. The pain from the caesarean was still there and I didn’t want to risk anything pressing against my scar. One night though baby boy just wouldn’t settle. He just didn’t seem to know what to do with himself and Mr K and I were quickly running out of ideas. I decided to try the Moby. It took me while to get it on and tied correctly but within seconds of baby boy being put in, held close to my chest, he stopped crying. It was a miracle. Within minutes he was asleep! Over the next few months the Moby became my go to accessory. I used it around the house, for walks to the shop and even used it to carry baby boy around The Baby and Toddler Show. We received mixed comments. A lot of people had never seen a stretchy wrap before and were intrigued, asking how it worked and was it complicated. Other people dismissed it straight away saying that they wouldn’t have the time or patience to put it on. A small number of people told me that I would spoil baby boy by carrying him too much! What nonsense! I recently acquired 2 more carriers, a woven wrap and an Ergo (which I believe to be fake but that’s another story). The woven wrap is pretty much the same as the Moby except that it is made from a stronger, non stretchy material to enable me to carry baby boy as he gets heavier. The Ergo is what is called a soft structured carrier. It is done up using buckles and so is quicker and easier to put on. The Ergo is Mr K’s favourite whilst I love the brightly coloured woven wrap. As baby boy grows I will need to learn how to do back carries to ensure comfort for both of us and despite YouTube having a number of videos for this, I think that I will need to visit my local babywearing group for guidance. For anyone considering babywearing I would seriously suggest looking online to see if you have a sling library/babywearing group in your local area as they can offer advice and support as well as allowing you to try different slings and carriers to determine which ones suit you and your child. Mr K and I only tend to babywear now when out and about but the benefits are still numerous and I look forward to carrying for a good while yet. 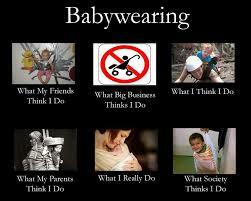 Do you babywear? Which carrier do you use?